Image: foto76 / FreeDigitalPhotos.net "What's for dinner tonight?" Deer are like our pygmy goats, they are generally browsers, taking a nip here and there as they graze. When a particularly tasty leaf, bud or flower is found, all the buds on a single plant may be consumed, but the stem right next to it could remain complete and whole. A customer, from many years back, living on an island with a high deer population related that one year an entire clump of lilies had all the buds eaten, but the second year the deer went after the roses instead and left the lilies, which had more flowers than ever before. Basically, the deer did what commercial growers do to increase the size of the following year's bulb; they remove the flowers to allow all the energy into making a larger bulb. Our customer said she didn't mind if they "pruned" a few stems after that experience. When we had a propagation field in the middle of the Port Townsend city limits, some varieties would be skipped all together in favor of the next plants in line. Of course several miles away, just above the Fort Worden State Park, roses had no chance and I kept losing my grapes just when the clusters began to show, but usually we just missed a few lily buds here and there before the neighborhood dogs would chase them off. Occasionally there would be more substantial damage. For both rabbits and deer a physical barrier is most effective, but nasty tasting repellants will also work for a time. If your neighbors are feeding "Bambie" and the deer have lost their fear of people then a physical barrier is a must; if they are still a bit on the wild side, dogs (even little noisy ones) can do a very effective job of making their stay unpleasant. Remember that deer are very good at jumping over a shorter fence, they will go over anything they can see through, and so a solid fence is perfect. Deer will rear up to "look" over a fence, they want to know where to land before leaping (sensible). The down side is that type of fence is expensive. Adding another two feet of "decoration" at the top helps but check with your building code first. The black netting type of deer fence works pretty well, it can go up as a temporary measure and then be taken down before winter. Many years ago, I asked our local Wildlife Enforcement Officer what to do about the deer. He suggested a simple 4 foot tall woven wire (field fence) on the outside of my garden, then on the exterior side of the fence placing a horizontal arm about 12 inches out to string a battery or solar "hot" wire used for livestock. Deer prefer to duck under, rather than leap over obstructions, but deer hair is hollow and doesn't conduct an electric current. Our Jefferson County Agent, Phillip, said the secret is to put strips of heavy duty aluminum foil every few feet along the hot wire, smeared with creamy peanut butter. If using this method, only turn on the fence at night when it is quiet and nothing else is distracting the deer and small children are not tempted to touch the wire. The next few mornings you may need to repair the fence a bit but after a few shocks your "long-legged rats" will get the message. Turn it back on when the deer begin to get brave or new animals that have not yet been conditioned arrive in your garden. A variety of methods work best, don't use just one control, keep changing things around; put lilies in pots on a high deck - and a gate at the top of the stairs - should you have "climbers". 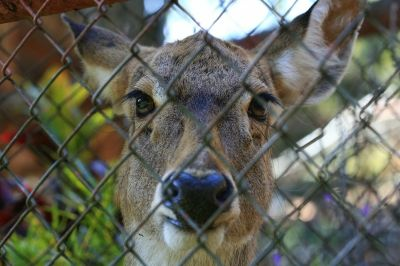 It goes without saying, don't throw old apples to the deer you are trying to repel and if the neighbors insist on feeding them, well - good fences make for good neighbors. Putting another "hot" wire at the bottom should take care of racoons and wandering dogs as well. Rabbits would need electrified mesh wire at the bottom or would need to have the bottom of the fence buried in the ground with rocks to keep them from tunneling under. With all the coyotes here, we really do not have a rabbit problem ourselves. Do you have a successful tip to share? Go to our BLOG and tell us your story.